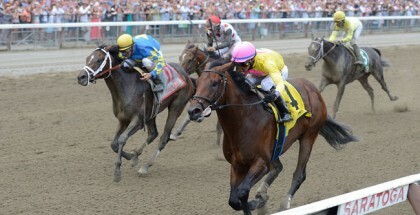 Home » News » Holy Bull Stakes 2013 Results: Itsmyluckyday Wins! Holy Bull Stakes 2013 Results: Itsmyluckyday Wins! Itsmyluckyday poses for fans before winning the 2013 Holy Bull Stakes and setting a new Gulfstream Park record. Itsmyluckyday with 9-2 odds placed first in the 2013 Holy Bull Stakes at Gulfstream Park on Saturday, January 26. Heavily favored Shanghai Bobby crossed the finish line in second place with even 1-1 odds. 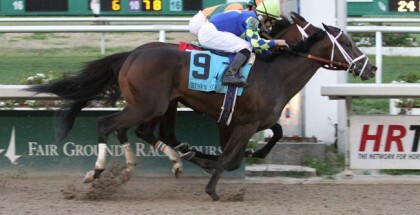 Itsmyluckyday and Shanghai Bobby both set new Gulfstream Park track records during the Holy Bull. Itsmyluckyday finished the 1 1/16 mile race at 1:41:81. Shanghai Bobby broke from post position number one with Rosie Napravnik aboard and went straight for the lead during the $400,000 2013 Holy Bull Stakes. Itsmyluckyday stalked Shanghai Bobby towards the second half of the race inevitably passing him and finishing two-lengths ahead. Elvis Trujillo was atop Itsmyluckyday for his 2013 Holy Bull Stakes victory. The colt has won five out of his nine career starts. 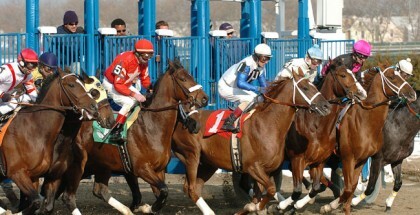 Itsmyluckyday was awarded ten points towards his entry into the 2013 Kentucky Derby. 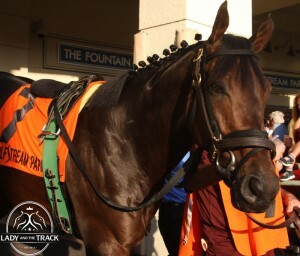 Amongst the field of 10 for the 2013 Holy Bull Stakes was fan-favorite Dewey Square. 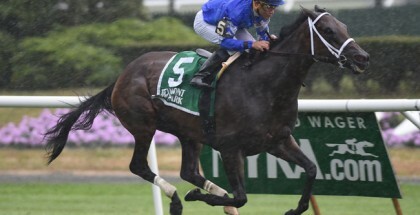 Experts predicted the handsome colt would show his speed during Saturday’s race. Sadly, Dewey Square had some trouble handling the dirt. “He just didn’t like having dirt thrown in his face”, sources revealed. Additional information was released via facebook stating, “Dewey looked bright and sound today. He ate most of his lunch, so he’s feeling ok. But he definitely hated the sandblasting he got going around the turn, and he will have to try another race strategy or get used to the dirt in his face. They can learn from a bad experience.” – Doug Cauthen, Siena Farm’s racing manager. Lady and The Track would like to congratulate Elvis Trujillo, trainer Edward Plesa Jr., Trilogy Stable, and the speedy Itsmyluckyday on their 2013 Holy Bull Stakes win and new Gulfstream Park record! 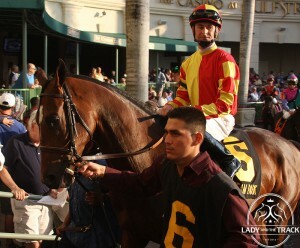 Dewey Square and jockey Corey Lanerie preparing for the Holy Bull Stakes at Gulfstream Park on Saturday January 26, 2013. 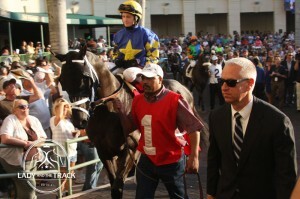 Shanghai Bobby, jockey Rosie Napravnik, and trainer Todd Pletcher walk the ring before the Holy Bull Stakes. 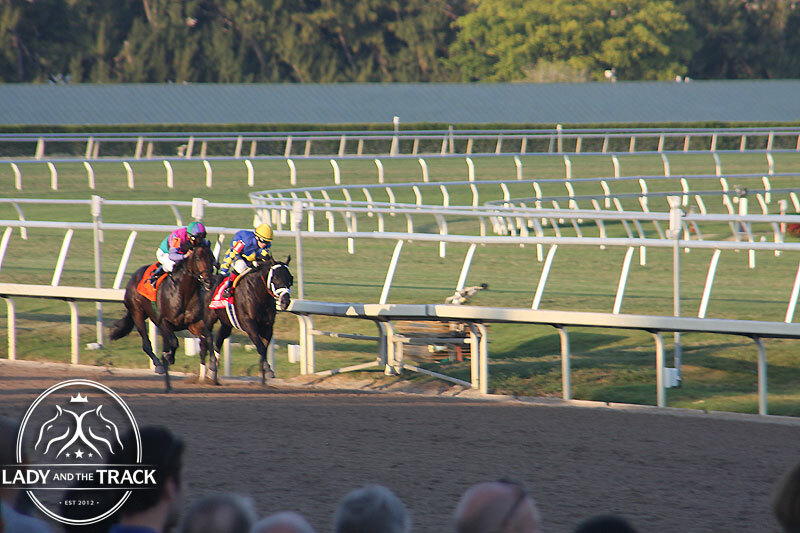 Itsmyluckyday and Shanghai Bobby fight to the finish line during the 2013 Holy Bull.